Wireless, battery operated pressure recorder for monitoring pressure and capturing transient events in your distribution system. 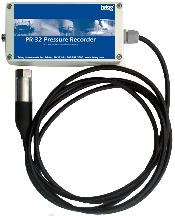 The Telog PR-32i is a versatile instrument intended to monitor water system pressures or water levels (e.g. underground aquifers, surface reservoirs or water tower levels). It is available with a choice of pressure sensor ranges, from 1 to 500 PSI and cable lengths up to 500 feet. In addition to performing the measurement and recording functions of the standard Telog PR-32 pressure recorder, the impulse recording option feature of the Telog 32i units stores the waveform of captured pressure transients and water hammer events. The Telog PR-32i can store up to 100 events of variables duration that may occur over many months of on-site monitoring, monitoring up to a maximum of 15 minutes of transient data at 32 samples/second. You can configure the Telog PR-32i to call its host application on a schedule (e.g. once per day; every four hours, etc.) and/or on alarm (e.g. in response to a high or low pressure or level exceedance condition). The recorder can sample the pressure sensor up to 4 times/second and store the data statistics (min, average, maximum or totals) at user defined intervals (e.g. five minutes, one minute, etc.). Data loss is not a concern because the recorder stores over 80,000 interval statistics before overwriting the oldest data with new. The Telog PR-32i uses a Telog proprietary, low power m2m cellular modem certified for operation on the Sprint, Verizon Wireless and Bell Canada cellular networks in North America and various cellular carriers internationally. The cellular modem, antenna, pressure signal conditioning, data recorder and battery are integrated into a small, environmentally rugged package making the Telog PR-32i easy to install and put into service. The recorder operates up to five years making on average two calls per day from its user replaceable ‘D’ cell lithium battery. Telog Enterprise and Telogers for Windows host application software support the Telog PR-32i. However, Telog also offers a Data Hosting Service for users who prefer to outsource the computer data collection and management tasks providing end-use information on a secure website. -- Note: Normal mode operates as specified above when impulse mode is on or off. --- Data Recorded: Normal mode interval data plus transient event waveforms including pre and post transient even data, user configurable. --- Impulse Memory: Up to 100 transient events to a maximum of 37,000 samples after which new data will overwrite oldest data.